When I was a kid, my father used to stroll around the house performing an early precursor to rap. He was quite a visionary performer, actually, to have foretold the popularity of spoken-word singing. He also prepared me for unsavory song content by teaching me the words to “Mack the Knife” at age 10. I can still sing every one, scarlet billows and all. But bunnies seemed to be the bosses of the Easter world, so I spent my childhood a bit confused about how rabbits produced eggs. Anyway, no matter where they came from, eggs were what we rapped about. Maybe that’s why I wrote an entire cookbook of recipes for deviled eggs. This one makes a beautiful deviled egg that will surprise people at your Easter dinner – it’s not the usual pickle relish. Definitely worth rapping about. Combine the thoroughly mashed yolks with the sour cream, cream cheese and mustard. Stir in the smoked salmon and onion. Taste, then season with salt and pepper. Fill the whites evenly with the mixture and garnish each egg half with 3 or 4 capers. If it’s March Madness, then I’m planning to feed the inmates well. When the ACC Tournament starts tomorrow, the odd sausage ball will be thrown here, the occasional adult beverage will be consumed there. But the occasion just screams for dip. A friend, who is as nutty as I am, hosted a lunch-game viewing a couple of years ago. In an excess of patriotism, she tried to create a Carolina Blue onion dip. It was….um…interesting. It tasted like the usual onion dip, but it’s amazing how the color changes one’s perception of one’s food. I like a good onion dip, and I’ve been trying to avoid the guilty salt-lick pleasure of the onion soup variety. I came up with this recipe for my new book, “Buttermilk: A Savor the South Cookbook,” published by the University of North Carolina Press. Just keep away the food coloring. Preheat the oven to 425 degrees. Lay out 2 doubled pieces of aluminum foil. Place the onion in one piece and the garlic in the other and drizzle both with a little olive oil. Wrap each one tightly, place them on a baking sheet, and roast for 45 minutes to 1 hour. The onion may take slightly longer to roast than the garlic. Remove each from the foil and let cool to room temperature or wrap tightly and refrigerate for up to 2 days. Remove the outer skin from the roasted onion and place the onion in a blender. Press the roasted garlic cloves out of their skins and add them to the blender. Add the dill, thyme, buttermilk, sour cream, salt, pepper and ground mustard. Puree until smooth. Cover and refrigerate. 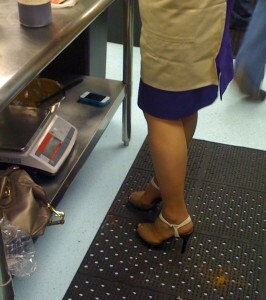 I am convinced that my friend Brenda is a reincarnated Jewish grandmother. When she invited The Hub and me for dinner recently, she spread out enough food for 20 and was concerned that we barely made a dent in it all. She cooked Brussels sprouts in a way that I’d never seen before – and I’ve seen some sprouts; I love them. She cooked them with a combination of broiling and steaming that resulted in Brussels sprouts that were tender and not overcooked, just “al dente.” Of course, she just throws things together (like all good reincarnated Jewish grandmothers) and didn’t have a recipe, but I re-created the dish from her description. It was also my first time using grapeseed oil, and I like its nutty flavor. Brenda used it just because someone gave it to her and she wanted to use it. It has a higher smoke point than olive oil and that may help in this recipe, too. The only big caution I have is to watch the vegetables carefully, and shake or stir often to avoid burning. Because Brenda’s sprouts didn’t have a single toasted leaf. Cut the Brussels sprouts into halves or quarters, whatever makes all the pieces close to the same size. Thinly slice the red onion. Put both in a shallow roasting pan and toss with a liberal amount of oil. Place under the oven broiler and cook, tossing or stirring frequently, for 3 or 4 minutes, until you start to see them possibly brown. But don’t let them brown. Remove from the oven, sprinkle with salt and pepper, and put in a heatproof bowl. Cover the bowl tightly with plastic wrap. The vegetables will steam to tenderness. Let them sit as long as you like – this dish is good at room temperature as well as hot – but they will need to sit for at least 20 minutes. In the neighborhood outside Winston-Salem where I grew up, every backyard had a sizable garden, and every garden had tomatoes. By midsummer, when the tomatoes were flowing into kitchens like red snowballs in an avalanche, kids would be dispatched to leave them on other people’s back stoops. This was the annual tomato-go-round, where my parents would send extra tomatoes to people who had already sent their surplus tomatoes to someone who dropped off their spare tomatoes at our house. 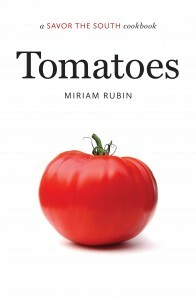 If a book like Miriam Rubin’s had existed then, it would have ground the tomato-go-round to a halt because no one would have been willing to give up a single orb before trying all 50 recipes within it. “Tomatoes: A Savor the South Cookbook” (University of North Carolina Press, $19) includes savory tomato pie, tapenade, salads, soups, pickles, a tomato cake and more. I’m glad to see that she knows the proper place to eat a tomato sandwich (over the sink) and that Southern-style tomato gravy isn’t the kind found in Italian restaurants. Canned tomatoes work well in many of the recipes, giving options when summer is over. She also suggests what I’ve been telling tomato fans to do for years: When the avalanche hits, chop up those tomatoes and freeze them. I believe that a cookbook about peaches in which the first recipe is for peach ice cream has its priorities straight. 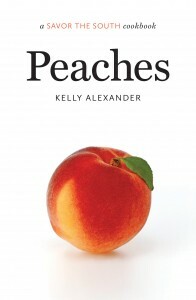 Such is the case with “Peaches: A Savor the South Cookbook” by Kelly Alexander (University of North Carolina Press, $19). In fact, the book unashamedly begins with desserts and works its way through other ways to use peaches, including an intriguing Peach Tempura and the green peach salad from Crook’s Corner in Chapel Hill (which I have enjoyed). Alexander amply recognizes the wonderful uses for peaches in beverages. And I can’t say that I’ve ever read a cookbook before that quotes Sir Thomas More. There’s a great variety of recipes. My only wish is that she had mentioned how to freeze summer peaches at home and where frozen peaches might work in some of the recipes. Seems to me they might work in the Tangy Peach Barbecue Sauce if I crave it in November. I am all for extending peach season, and this book makes me want peaches now. These just-released books are the latest in UNC Press’ Savor the South series of small books on Southern ingredients. This fall will bring books on biscuits and bourbon. And in the interest of full disclosure, I wrote “Buttermilk,” one of the first two books. Here’s some advice: If you want to get as much of a particular food that you could possibly want, just publicly tell people you don’t like it. It must be the same cosmic law that makes cats go straight for the laps of the one person in the room who hates them. Ever since I wrote a column proclaiming that I see no point in the cupcake, I have been asked to judge cupcake contests. “You know I’ve said in print that I don’t like them, right?” I tell the supplicants. But they are ever hopeful that their cupcakes will be the ones that bring me over to the side of goodness and light. Carolina at Chapel Hill football coach; Debra Morgan, WRAL-TV personality; Mike Wheless of WQDR; and The Biggest Loser’s Ed Brantley and Heba Salama. Each team received a basket of North Carolina products from which to craft their cupcakes. Fedora’s team got Chapel Hill Toffee, Top of the Hill Stout, Vintage Bee Cinnamon Honey, Chapel Hill Creamery goat cheese and – believe it or not – Neal’s Deli pastrami. For Morgan, it was Videri pink peppercorn chocolate, Larry’s Beans coffee, Fullsteam’s Working Man’s Lunch beer, Southern Season marshmallow creme and cheddar cheese spread from the Angus Barn. Wheless worked with sweet potatoes, pecans, bacon, Mount Olive sweet pickle relish and scuppernong wine. That left Brantley and Salama with Krispy Kreme doughnuts, Texas Pete, Moravian spice cookies, wine from Biltmore and Pepsi. Points were deducted for not using all the ingredients (which I desperately hoped Fedora wouldn’t; I would’ve given him points for leaving out the pastrami). My two fellow judges and I did the main judging, and those present (the contestants could invite 20 people each) did a people’s choice. The combination of chocolate and coffee flavors made Morgan’s team the clear winner of the four. Adding the cheese to the buttercream frosting made it stand up in firm swirls, but didn’t give it a cheese flavor. Morgan split the $1,000 prize between the Caring Community Foundation and Alzheimer’s N.C. Wheless’s creation was the fan favorite, earning a professional version the right to appear on Sugarland’s menu in March. Sugarland will donate 75 cents of each of the cupcakes sold to Wheless’ charity, Communities in Schools of Wake County. After the contest, Sugarland decided to give $500 to each of the other three contestants’ charities, including Fedora’s, N.C. Children’s Hospital; and Brantley and Salama’s, Pay It Forward Fertility Foundation. It was a delightful time and made some sweet dough for some good charities. But, sorry, cupcakes….I’d still rather set my own serving size of cake.